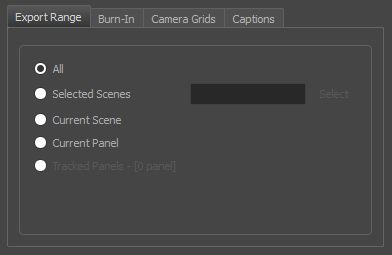 The Export Movie dialog also allows you to export your project in sequences of images, each one representing a single frame in your animatic. Jpeg (*.jpg): An image format with lossy compression optimized for the Web. Only use this format if you want to make a quick test of your image sequence. Targa (*.tga): An image format with standard lossless compression. Portable Network Graphics (*.png): An image format with a more effective lossless compression than Targa (.tga). Exporting in this format is slower, but saves a lot of disk space. Also, .png files are more portable and widely supported as an exchange format. Print Time Code: Prints the global timecode on each rendered image. Print Scene Names and Panel Numbers: Prints the scene names and panel numbers as an overlay on your video. 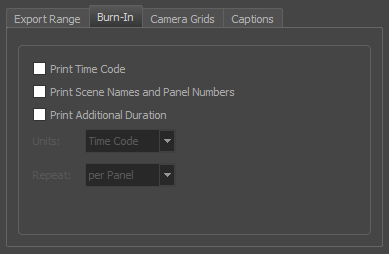 Print Additional Duration: Prints another time code counting the time for the current panel, scene or sequence, depending on what is selected in the Repeat drop-down. Units: Whether to print the additional duration in time units (seconds, minutes, etc.) or in frames. Repeat: Decide what to count the time of for the additional duration. For example, if set to per Panel, the time elapsed since the beginning of the current panel will be printed. Title Safe Area: Prints the Title Safe Area over the picture. By default, this area is 20% smaller than the camera frame. It is used as a guideline of the area that CRT displays might crop out of the picture. Visual elements such as text and logos should be placed within this area. Action Safe Area: Prints the Action Safe Area over the picture. By default, this area is 10% smaller than the camera frame. It is used as a guideline of the area that CRT displays might crop out of the picture. Characters and action should be placed within this area. 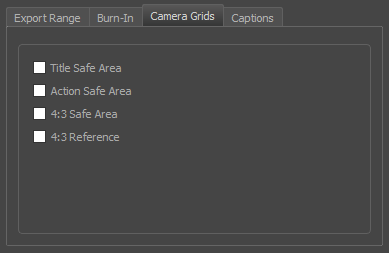 4:3 Safety: Prints the title safe area and the action safe area for the 4:3 camera frame over the exported image. They can be used to position elements in projects that are meant to be displayed in both widescreen and 4:3 proportions. 4:3 Reference: Prints the 4:3 camera frame over the exported image. This frame corresponds to the camera frame if the aspect ratio of the picture was 4:3. 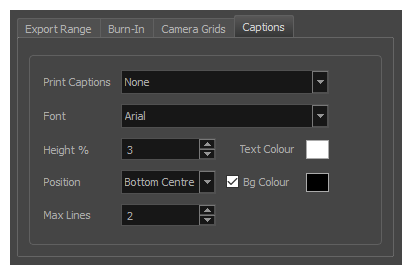 It can be used to position elements in projects that are meant to be displayed in both widescreen and 4:3 proportions. 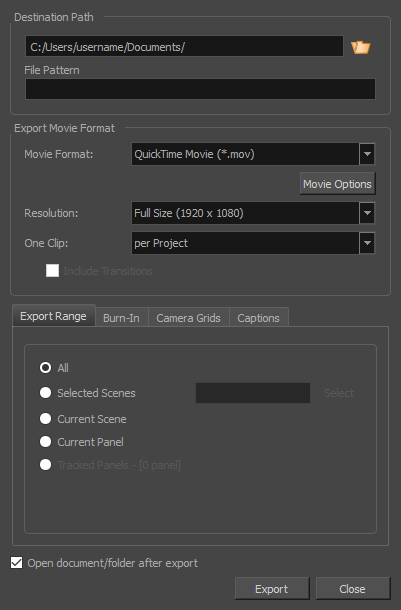 In the Captions tab, you can choose to print any of your storyboard’s captions into the exported movies using the following options—see About Captions.